Most of you are probably familiar with NVIDIA's Tegra line of system-on-a-chip boards - Tegra 2 was behind most of the first wave of Honeycomb tablets, Tegra 3 powered the Transformer Prime and Nexus 7, and there's this little thing called SHIELD with Tegra 4 coming next week. But their latest promotional efforts take the spotlight off of a fully integrated solution to focus on NVIDIA's bread and butter: the GPU. PC gamers and designers know about Kepler, NVIDIA's line of 28 nanometer GPUs. In gaming terms, it covers most of the GeForce GTX 600 and 700 graphics cards. Today they're demonstrating a mobile version of Kepler, set to debut with their next generation of silicon under the Project Logan code name (continuing with NVIDIA's general superhero theme for mobile products). This isn't just a marketing tactic - according to the company's introductory literature, the mobile version of Kepler uses the same GPU architecture as the desktop, laptop, and workstation cards of the same name. If NVIDIA's naming convention holds, Logan will likely come to market as "Tegra 5." To demonstrate this, NVIDIA has put up a couple of video demos. The "Ira" demo is perhaps the most dramatic. It's a mobile translation of a video demo given in March, demonstrating the visual performance of the GTX TITAN, the company's top-of-the-line desktop gaming card (which retails for about $1000 USD). Here's the older demo. Below you'll see the Ira facial rendering and animation demo given on a prototype Logan system with the Kepler mobile GPU. The mobile version of Ira isn't quite as jaw-dropping as its desktop counterpart, but it's still easily the most impressive demonstration of its kind on mobile hardware. 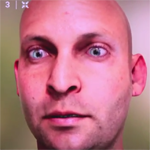 The real-time face simulation tries to hop right over the uncanny valley, using an incredibly detailed polygonal model, high-resolution textures, HDR lighting effects that work through multiple layers of simulated skin, and conventional graphics effects like FXAA, tone mapping, and bloom. Particular attention has been paid to sub-surface scattering, a shading system that simulates light passing through skin - note the ears. This version of the Ira face is running full HD (1920x1080) instead of 4K. Of course, this sort of thing isn't likely to make it into a mobile game (or even a desktop game) for quite some time - system resources have to be dedicated to rendering the environment, other characters, physics and AI engines, et cetera. A more pertinent demonstration is NVIDIA's Island video, running on the same prototype Logan/Kepler mobile hardware. This one is focused on graphical tessellation, dynamically enhancing the polygonal models for the player's viewpoint. This allows a game or video to efficiently simulate more detail as the viewpoint shifts. Check out the water effects as well - very impressive, even when compared with the latest Tegra 4 games like Riptide GP 2. 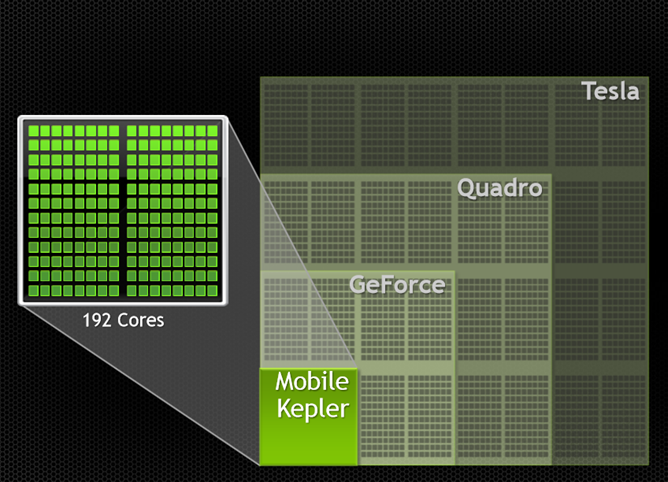 When it comes to the technical side of things, NVIDIA is most proud of Mobile Kepler's power consumption. The demos above are running on mobile hardware drawing 2-3 watts for the GPU, compared with 250 watts for their TITAN desktop counterparts. According to NVIDIA, their new GPU is consuming less than a third of the power of the GPU in the Retina iPad. Developers will be glad to know that Mobile Kepler supports the new OpenGL 4.4 API, as well as OpenGL ES 3.0 and DirectX 11. It also supports CUDA, NVIDIA's parallel computing standard, which allows for parallel processing with CPUs for more efficient graphics and physics calculations (along with more general computational processes and "big data" distributed projects). NVIDIA's blog post also highlighted Kepler's anti-aliasing and post-processing capabilities, along with motion blur, depth of field, and global illumination effects. Outside of graphics, Kepler can be implemented for augmented reality, speech recognition, and general imaging. NVIDIA is currently demonstrating prototype hardware at the SIGGRAPH conference in Anaheim. Kepler GPUs and Logan SoCs have only just entered the testing phase at NVIDIA, and their last roadmap indicated that they'd be coming to finished mobile hardware sometime in 2014.